"The relatively slow conditions should help the Argentine, who actually performed fairly well in defeat in similar conditions at Indian Wells, losing a final set tiebreak as a heavy underdog against Jordan Thompson in the opening round, despite creating more break point chances than the Australian." After a successful tournament in California, where we went 6-2 with all recommendations priced close to even money or greater, we travel East across America to the upcoming Masters 1000 event in Miami. One direct effect of the travel is that the matches are in a slightly friendlier time zone for European bettors and traders, with matches beginning at around 15:30 UK time, as opposed to 18:00 in Indian Wells, and the natural knock-on effect from this is that each day's schedule should also conclude earlier. There's 11 first-round matches on the card tonight in the men's tournament, with big names not beginning their campaigns until Friday at the earliest, with the draw being of the same format as Indian Wells - the top 32 ranked players received first round byes. Conditions, as discussed in the outright preview, are again expected to be pretty slow for an outdoor hard court, and this could potentially negate the more serve-orientated players in the field. Last week's champion Dominic Thiem certainly enjoyed conditions, with service data showing the venue speed is more akin to a slightly quick clay court - right up his street - and there isn't much of a difference between Indian Wells and Miami as venues, statistically speaking. Tonight's schedule is a little tricky to negotiate with a number of quite trappy clashes as round one gets underway. It almost goes without saying that I certainly don't recommend that punters go big on round one action, where player fitness is often questionable. One player who is unlikely to enjoy the slower conditions is Marius Copil, who tends to do his best work at quicker venues (particularly indoors). If it wasn't for such concerns today (and I mentioned this last week too), he would look generously priced at [2.34] to beat Albert Ramos, whose record on hard court over the last 12-18 months is pretty woeful. Another player whose recent record is quite mediocre is Peter Gojowczyk, who has seen his 12 month hold/break percentage on hard court fall from about 100% around last summer to a current 90%. His record in 2019 in isolation is also very poor, running at just under 93% as well, and the German is certainly in quite the slump. Today, Gojowczyk faces Federico Delbonis, whose record on hard court is utterly dire too, but in the last 12-18 months it is better than Gojowczyk's. In addition, the relatively slow conditions should help the Argentine who actually performed fairly well in defeat in similar conditions at Indian Wells; losing a final set tiebreak as a heavy underdog against Jordan Thompson in the opening round, despite creating more break point chances than the Australian. With Gojowczyk's slump in mind, Delbonis is our tentative recommendation at [2.26]. I actually make him a very marginal favourite to take this. 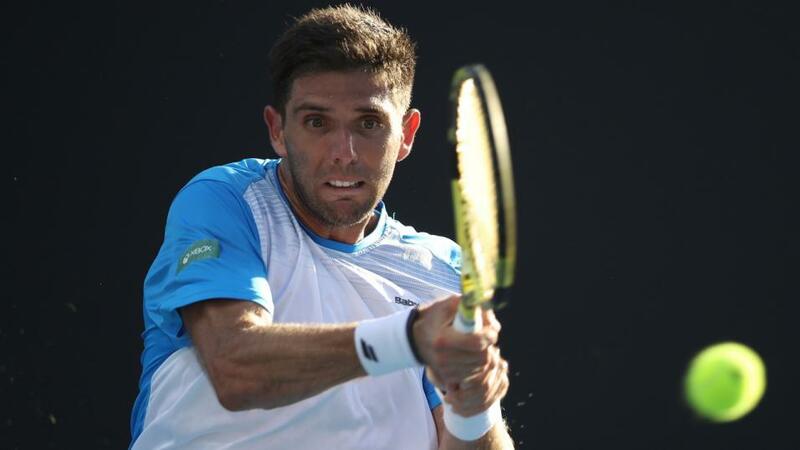 I also quite like Roberto Carballes Baena as underdog at [2.40] against Denis Kudla, and assuming full fitness, Bradley Klahn at [1.73] as he faces the semi-retired Janko Tipsarevic. There's also another tricky-looking match to call as Mischa Zverev faces the Spanish youngster, Nicola Kuhn, with the German veteran without a win to his name this season and running at 0-7 (combined service/return points won percentage of below 90%) in the last six months. Zverev is [2.12] to get the win tonight. There's also some decent young prospects in action, notably the clash between Matteo Berrettini and Hubert Hurkacz, who caused several shocks in California across the last two weeks, while the more seasoned campaigner, Tomas Berdych, takes a 5-0 lead into his meeting with Bernard Tomic, and looks accurately priced at [1.29] to get past the volatile Australian this evening.